Users select their food on the app, drop a pin to where they want their delivery to be sent to and can then watch the robot make its journey via an interactive map. Users receive an alert when the food arrives and can unlock it through the app. 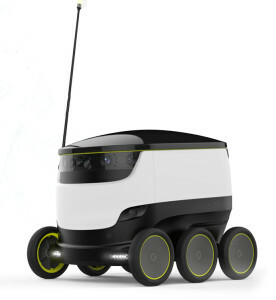 Each delivery is to take 15 minutes or less and each robot can carry up to 20 lbs. “We’re excited that our students, faculty and staff get to be at the forefront of this pioneering campus food delivery service,” added George Mason University executive director for campus retail operations Mark Kraner.